J.A. Mol (2007) Gallows in Late Medieval Frisia, in Bremmer Jr, R.H., Laker, St., Vrie, O. (Eds.) Advances in Old Frisian Philology. Amsterdamer Beitrge zur lteren Germanistik Band 64 (pp. 263-298). Amsterdam/New York: Rodopi. Late Medieval Frisia is exceptional for its large number of gallows, which was the result of the transference of the right of capital punishment from overarching to regional and even to local level, and, therefore, it seems to be an indicator of decentralisation of power. The text of this enhanced publication is a summary of the printed version. 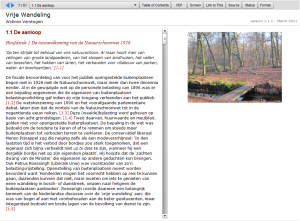 From each slide in the Flash version the user can access the related page in the full text PDF. K. van Dalen-Oskam (2012) Altijd naar het noorden. This publication presents the first results of a pilot project regarding computational research on literary style. The stylistic elements in this study are proper names. The main research question pertains to the use and the function of names in literary works. 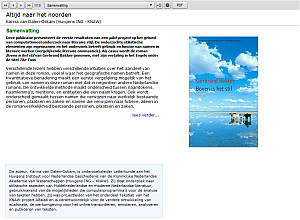 The novel Boven is het stil by Gerbrand Bakker (translated as The Twin) has been chosen as a case study. This enhanced publication contains the full text, frequently using the facility of continuation text. Besides, also here, each slide in the Flash version is linked to its related PDF page. 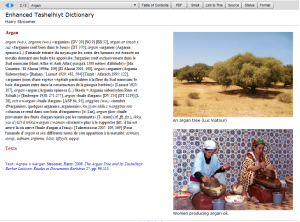 Harry Stroomer (2011) Enhanced Tashelhiyt Berber Dictionary Prototype. Tachelhiyt Berber, spoken in the south of Morocco, is the world's largest Berber language in terms number of speakers which is estimated at 10 million. However, this language has no adequate dictionary. The Tashelhiyt Berber dictionary seeks to fill that lacuna. The dictionary is based on lexical material on this language that Harry Stroomer has collected over more than 20 years. This application is a Prototype of an Enhanced Dictionary which seeks to expand the lexical data with supplementary media in form of pictures, texts, articles and other media. Wybren Verstegen (2012) Vrije Wandeling (Free Walk). Het parlement, de fiscus en de bescherming van het particuliere Nederlandse natuurschoon. De Natuurschoonwet tussen 1924 en 1995. CLUE Research institute for the heritage and history of the Cultural Landscape and Urban Environment, VU University Amsterdam. Landscape and Culture of the River Vecht (Utrecht, Netherlands, 2008). Panoramic overview. 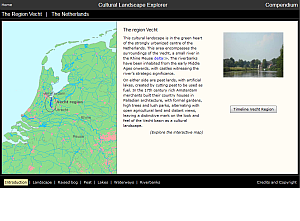 This application was created as part of the Cultural Landscape Explorer project and is a co-production of the Vechtplassen Commissie and the Utrecht University (see credits in the application). See also entries in the section Multimedia Applications. Geonarrative of the River Vecht (Utrecht, Netherlands, 2008). Map-based story about the river Vecht and its surroundings. This application was created as part of the Cultural Landscape Explorer project and is a co-production of the Vechtplassen Commissie and the Utrecht University (see credits in the application). Settlement along the river Vecht (Utrecht, Netherlands, 2008). Short historical overview of the rise and decline of stately homes. 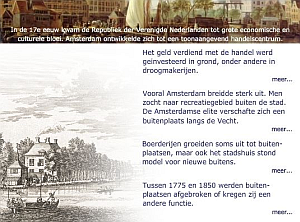 This application was created as part of the Cultural Landscape Explorer project and is a co-production of the Vechtplassen Commissie and the Utrecht University (see credits in the application). Land and water (2008). 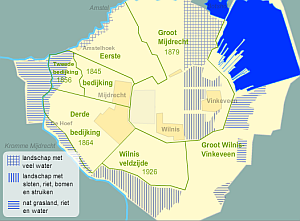 The alternation of land and water in the heart of the peat lands of the region Vecht. This interactive map was made as building block for a rich internet publication. How peat lands are used (2008). 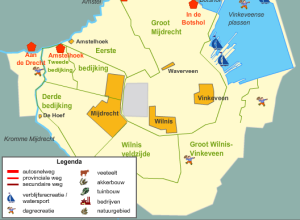 Interactive geo-economic map of one of the municipalities in the peat lake area: de Ronde Venen. This interactive map was made as building block for a rich internet publication. Peat digging. (Utrecht, Netherlands, 2006). 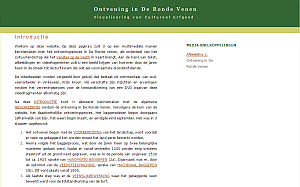 A website, made by Thijs Buurman, about peat cutting in the center of the Netherlands, the area of the Ronde Venen. The text is interspersed with video fragments. 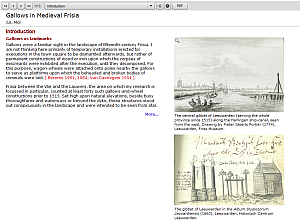 This web application was created as an assignment in the context of the study Information Science at the University of Utrecht, in close collaboration with the Vechtplassen Commissie.